I'm sure you've heard the buzz in blogland about Monica Rich Kosann's new book Living With What You Love, but if you haven't, here's my take. The book's underlying philosophy (Living with what you love) goes hand in hand to me with creating a home. We see so many beautiful images of homes every day, but how many of them seem personal and special to the homeowners? The ones that speak to me the most are the ones that feel real and loved like a "real" home. (vs a showhouse) The book addresses such a simple but core issue in a hands-on way that makes you want to get to work on your own home right away. Ove the years, Monica, a portrait photographer found that her clients were also looking to her to help them find special ways to display the beautiful photos she'd taken. Her "job" expanded and not only does she help families take photographs but she helps them fit them into their homes in ways that are personal & beautiful. Living With What You Love was so great to sit down with and inspired a few projects in our own home that I can't wait to get started with... One of them being a hallway full of kids' art projects and family photos. The hallway leading to our bedrooms is & has been totally blah since we moved in. We addressed most of the main areas in our house& now it's time for the hallways, and smaller spaces, which can make all of the difference. I'm going to take my time with this one and I want it to grown over the years almost like a huge inspiration board. What about you? Do you live with the things you love? What a wonderful book... need to get it! Just came upon your blog and enjoyed perusing through the posts. I live with only the things I love! The art of a designer or stylist is to display in a way that is meaningful and spontaneous. This looks like a wonderful book! I will have to check it out! I do live with the things I love and there are days that I fall out of love with the same things! It is the personal things that changes a house into a home. 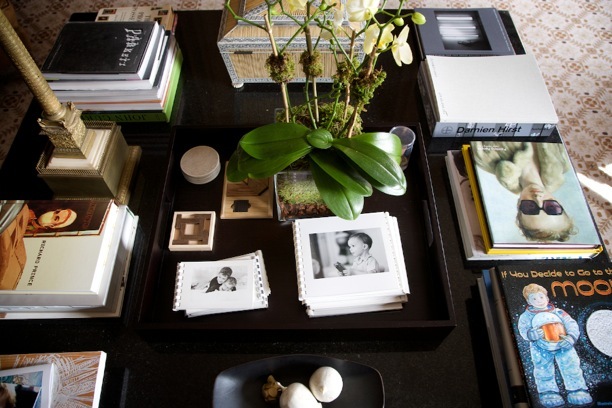 Can't imagine not have photographs everywhere in the home. This post reminds us how important it is to personalize. Beautiful images. Love the parrot too! Live with what you love and no matter what you bring home it'll work in your house. Love that first picture looks like my boy Dylan dog, how cute. I'm off to check out the book thanks for the heads up. Love this book and so glad you have shared it with those who are not familiar with it. I feel like I am always "preaching" to live with what you love because I feel so strongly about it. I know people who have designers come in and "do" their whole house and it looks like a hotel - the truth is, I don't think good designers do that. Really good ones capture the essence of their clients in their homes. See, I do start to get on my soapbox about this - sorry! Great post. Yes, but need to do better with photos. I want to do something similar with photos and documents (weird way to say it) in our hallway. I have a few things collected, I just need to start hanging! I do live with what I love but I have to remind myself every now and then that something I see (accessory wise) isn't me...it's beautiful in it's display but doesn't really fit my style. My favorite rooms are those that reflect what the owner finds to be important, reflects their lives. Sounds like a book for my christmas wish list. my problem is usually editing all of the things i love! I love the idea of only surrounding yourself with things that you truly love. I'm working on that myself. I'll have to check out the book! I have been reading your blog for awhile but I have never commented. I love your design philosophy and I love the philosophy of this book! What is a home if you're not surrounded by things you love? :) Thanks for sharing! Whenever I see the cover of this book, I am caught by the wonderful color palette: clear, pale blue, orange, rich browns, black, and neutrals. Love! And, yes, always good to be reminded to live with what we love! Maybe I should write the companion book "Living With The Stuff You Can Afford, Even If It's Not What You Love: Restoration Hardware Dreams/ Thrift Shop & Ikea Reality"
pretty sure it'd be a best seller...once it went on sale. I love this whole concept and philosophy. I have been doing some personalizing at home with photos and momentos but have to work harder at it. Have a great fall day! I totally need to get this book! I think living with the things you love just makes your home FEEL so much better, because everything has a story. I can tell anyone that walks into my home how, when, and where I got most everything. It all fits into the story of my life (and my families:) Great post. We live in such a loved home! I wouldn't have it any other way. Hope you are well. I live with the things I love and sometimes that changes every year or so. I fall in and out of love pretty often (with decor I mean, not my hubby:). I love to see new ways to display the things I love. I will have to check this book out for sure. Totally agree...yes, I do live with things I love. But, it has evolved and taken me some time. 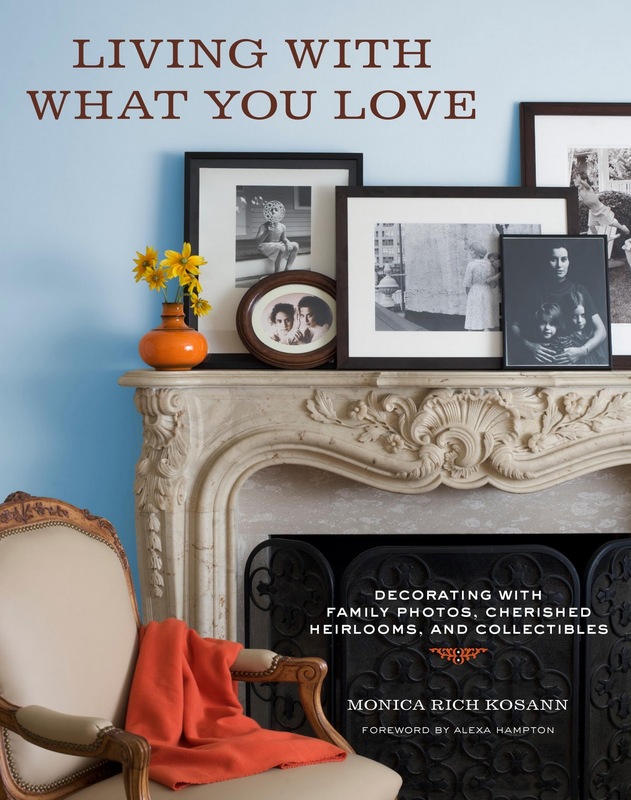 I picked up Monica's book this weekend -- she is very talented....jewelry designer, photographer and author. It's the only way to live! can't wait to get it, thanks for the preview. Yes, I think we are finding that living with what we love is so satisfying. That's why I'm taking my time furnishing/decorating our new home. Sometimes I get impatient, but I remind myself that it's better to wait and love it than hurry just to fill a space. I'm going to check out this book- the idea of casually stacking the photos is just great- makes you just want to pick up and start browsing through. We absolutely live with what we love..even if it gets us some funny looks sometimes. ..Thanks for the tips and the inspiration...We live with what we love & also what other people love..we find new homes for our furniture!..People are enamored by a piece as it "fits" into our lives....and thne want it for themselves!...If we feel it will work in their space...off it goes!...I am going to go find the book! ..Just did your home TOUR!...inspiration! Sounds like a wise book. I do live with the things I love and I wait to get the things I'd love to have. I do not rush design. would you believe I have never heard of this oranges till this year?? I have no idea where I have been....I have them around the house to rid bugs and spiders I never thought about decorating with them! great post!!! !